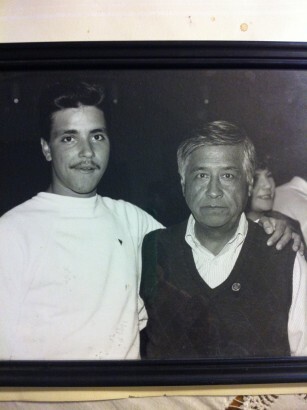 UFW Stories: "Cesar Chavez at Cal State University of Hayward, 1991"
"Cesar Chavez at Cal State University of Hayward, 1991"
Back in the early 1990’s, I was in a class with Professor Roxanne Ortiz-Dunbar. She said that she had met Cesar many years ago and that he had promised to speak at CSUH. Being young and Chicano on the 80’s in Hayward, the UFW symbolism was never too far. Memories coming back so vivid and clear as the raindrops continue to fall on the rooftop of my car at this moment. Offering therapeutic relief from the 9 to 5 grind. Jogging my memory of my life. 1968, in my momma’s belly when all the political and civil unrest was happening across our nation. The doctors cut the umbilical cord and I was thrust into the 1970’s and beyond! Time went by and it was a whole new scene appeared in the 1980’s. Big cars and bigger hair was in vogue. On the streets, a good one-on-one fist fight was always outside your door. One particular time my father, mother, and myself were watching a documentary on the UFW movement and the grape strikes in Delano. I discovered two things that Sunday morning before church. One, that there was a priest from Hayward, California on the picket line. Secondly, my dad said Cesar Chavez had gone to my maternal grandmothers birthday? I asked my mom and she said her brothers Jesus y Jose Capistrano were active in California union organizing back in the 1950’s. Back in that time period, I also caught a glimpse of a peaceful protest which turned ugly in San Francisco on the evening news where Ms. Dolores Huerta and other were injured. Riot police in full regalia swinging their batons at anything that moved! Thinking naively, back then that if all the ‘ghetto children’ would get unite, pick up a brick, throw it forward, and take 5 steps toward the line, the masses behind them would repeat the same maneuver never breaking file. At the same time there was a UFW speaker who spoke at Sunset High in Hayward about the cause and effect of the grape boycott. Boy, did our history teacher, Mr. David Payne, get in trouble by our principal for that one! He said later that it was worth it. In the 1990’s I was at Cal State Hayward which wasn’t too far away from home but just far enough. Down on the flatlands of my town, the good fight was replaced by the drive-by and crack cocaine. It hit and it hit hard! I lost more than a few friends to violence, substance abuse, and prison. How could anybody come out that era and place completely unscathed? House parties or dances, my generation experienced the brick throwing, 5 step forward maneuvering tactics, and they didn’t work! The game had all changed. Others had guns and that wasn’t too fun. Around that time, a few civil rights, history, and literature classes not only opened my eyes to the Plan of Delano but to the Plan of Ayala, the Chicano Moratorium, the civil rights movement, the writings of Langston Hughes, Lorna Dee Cervantes, Gary Soto, Oscar Zeta Acosta, and many more. The highlights of my college career was going to a minority law conference at the University of Iowa and graduation. The one moment that I will never forget is listening to Cesar speak and meet him at Cal. State Hayward. What I remember that day left a lasting impression. Cesar said, something to the effect that if you fight violence with violence than you are no better than the people or mentality one is trying to change. If you stand with your convictions, and for your rights, the actions of malicious people will not stand up to the light. The light being the majority of people. After that, a few friends and I saw Ms. Dolores Huerta speak outside the old Capitol where President Clinton was speaking to his peers inSacramento. She to, reiterated that organizations with clear ideals and a vision will stand the test of time. That this same principals could be taken from the farms and applied to our everyday lives. The same ideals that were born from the dirt could be used in an concrete setting to demand equal protection for everybody regardless of race, color, and creed!